BUFFALO – They hadn’t spoken in almost 17 years, since Ted Nolan’s first run as coach ended amid speculation Dominik Hasek, his star goalie, had just quit on the Sabres during the playoffs. The two, who reportedly feuded, never crossed paths again until Friday. After Nolan was essentially fired following the 1996-97 season, Hasek kept tending perhaps the best goal in NHL history, piling up awards while winning two Stanley Cups. Nolan, meanwhile, had trouble finding another NHL job. But Nolan’s back coaching the rebuilding Sabres, perhaps days away from receiving a contract extension. Hasek, having finally retired, is being inducted into the team’s Hall of Fame tonight. Time, of course, can heal old wounds. 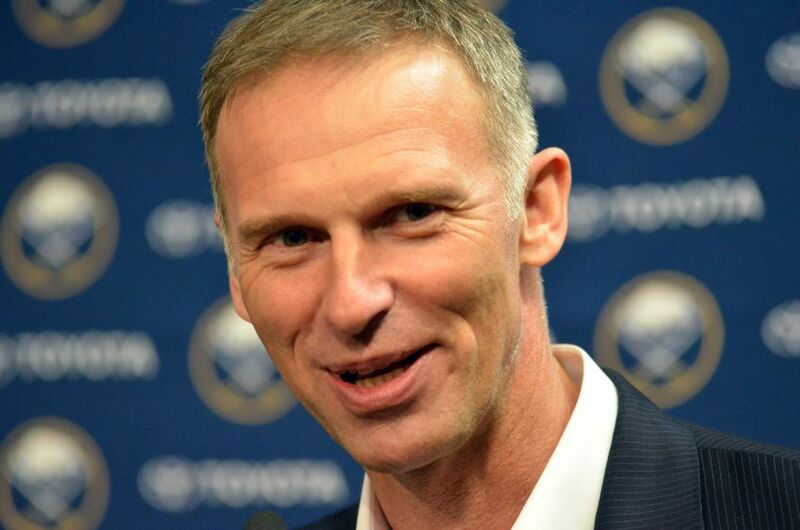 Hasek said he was “looking forward to seeing” Nolan. “But back then is back then,” he said later Friday after the Sabres prepared for tonight’s game against the Tampa Bay Lightning. “He looks well and he’s all happy and excited about being back here. We had a nice talk. We had some good times. Everybody looks at one incident. One incident doesn’t form the relationship. Those disagreements likely cost Nolan, the Jack Adams Award winner for top coach, his job here after a Northeast Division championship season. Much of that success, Nolan said, can be traced to Hasek’s dynamic goaltending. Hasek swears he’s retired from hockey. Remember, the 49-year-old left the NHL three times. He hasn’t played professionally since his one-year stint in the Russian KHL ended in February 2011. His goalie equipment hasn’t left the bag since then, Hasek said. These days, he plays once or twice a week as a defenseman in a rec league back in his native Czech Republic. “You wake up and you enjoy your life different ways,” Hasek said. Still, retiring wasn’t easy. Hasek wanted to return to the NHL during the summer of 2012. The Sabres’ old regime even met with him out of respect. Honors are starting to accompany Hasek’s post-hockey life. Pardubice, his old Czech club, retired Hasek’s number Dec. 1, an official sign he was done, he said. The Sabres announced Friday that No. 39 would become the seventh number retired in franchise history. Hasek will almost certainly become a first-ballot inductee into the Hockey Hall of Fame in June. Hasek, who’s involved a bit in hockey and in some business ventures, said he has always has new goals and something to prove. Hasek still follows the Sabres from afar. The Sabres nearly won a championship in 1998-99, when Hasek backstopped them Game 6 of the Stanley Cup final. The loss doesn’t haunt Hasek, who won the Stanley Cup with Detroit in 2002, a year after he demanded the Sabres trade him. “For me, it wasn’t (the) end of my life,” Hasek said about the 1999 defeat. How does Hasek, who won the Vezina Trophy a stunning six times, want to be remembered? “As a great goalie, as the personal goalie who gave the team (a chance) to win the game,” he said.